Elements Europe Ltd, a Pickstock Group Company, is an established market leader in Modern Methods of Construction, delivering a wide range of off-site building solutions to a number of sectors. Elements Europe’s latest project will deliver a new 1,300 sq ft learning facility to its client, the National Botanic Garden of Wales, enhancing the attractions educational offering to its visitors. The learning facility will be constructed by using Elements Europe’s Ty Unnos frame system, an off-site build solution. 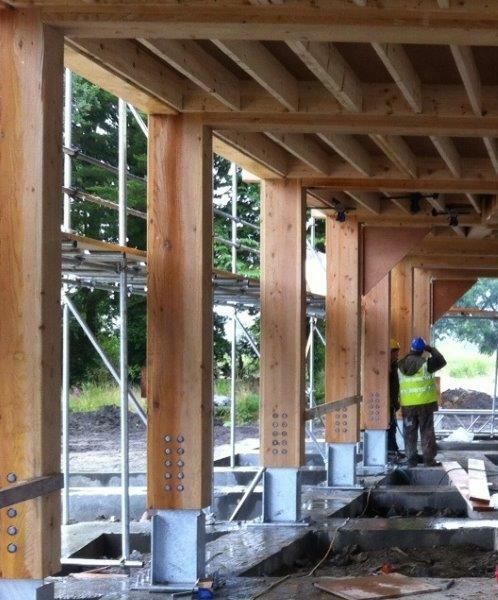 The Ty Unnos system encompasses Welsh Sipka Spruce Timber to provide a robust structural frame. The frame is constructed using the traditional Ty Unnos methods with modern technology to create a highly sustainable energy efficient build. Andrea Powell, Project Manager of the new Growing the Future project commented on the new learning centre, “Elements Europe stood out from the crowd for us due to their innovative Ty Unnos system. We feel that this method of construction and the materials used fits well with our core values here at the National Botanic Garden of Wales of conservation, inspiration and education. Its sustainable benefits of the timber frame and the fact that it is welsh sourced timber as well as their history in working on projects in Wales really struck a chord with us. We very much look forward to working with Elements Europe in delivering this new learning facility to the Garden”. Substructure works have commenced at the Botanic Garden with the facility due to open in October 2013. Sales Director Kevin Arthur says: “Elements Europe are proud to be selected as the delivery partner for such an important scheme that will provide high quality accommodation in a sensitive and sustainable manner”. Elements Europe, the main contractor for the project, is working with Welsh timber frame manufacturer Kenton Jones of Welshpool and G Adams Construction, a well-established South Wales contractor taking this project through to completion. The architects for the project are Dough Hughes of Newtown who through experience specialise in ensuring that sustainable buildings not only look and feel great, are sustainable, but work to a high standard.